Old map by BLAEU -Africae Nova Descriptio. Size: 16.1 x 21.8 inches. Condition: On strong paper with ample margins. Dark impression. One small pinhole (2mm) upper left border panel. 2 small strips of archival mounting tape on verso. An excellent copy. 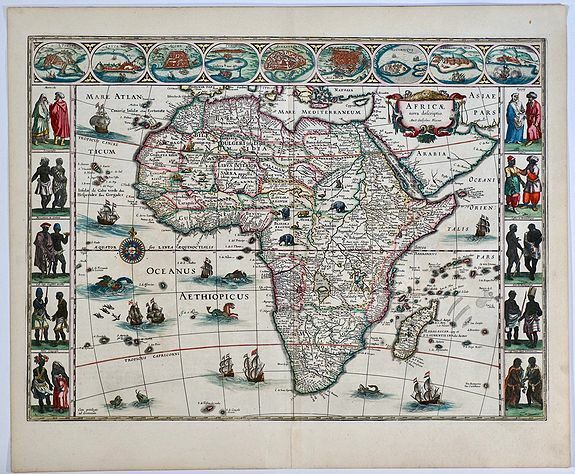 A very fine original-color example of one of the most decorative early maps of Africa. 2nd state of 1621-30. Latin text on verso. The top border panels consist of oval vignettes of nine principal cities. The map also depicts in its side panels a variety of costumed couples in traditional dress, including Moroccans, Senegalese, “Merchants in Guinea,” “Congolese Soldiers” and others. Nine ships, all flying Dutch flags, flying fish, whales and monsters are used to fill in the oceans while elephants, monkeys and lions, ostriches and camels are depicted on the continent. Reference: Norwich, Map 32; Van der Krogt 8600.2..